Thanks to our friends who have brought some claims circulating on social media to our attention. We owe an enormous debt of respect and gratitude to the Native Americans and First Nations people who choose our blankets, and care deeply about this relationship. We understand that it’s important to speak the truth. Pendleton’s mills are our pride and joy, and both are well over a century old. Keeping them updated is a priority and a challenge, but we think it’s worth it to keep weaving in the USA. Our mills are subject to inspections, and when problems are identified, we take immediate action to resolve them. We have earned third-party certification for sustainability (read more here), and our management is committed to providing a safe and healthy work environment for all employees. We respect the right of current and former employees to make political donations to candidates they personally support. These donations are not endorsements by Pendleton. Pendleton supports the Indian Arts and Crafts Act of 1990. We make our blankets for Native Americans, but we don’t claim our products are made by them. Our company’s history is always part of our marketing and sales materials, and is available on our website. Pendleton blanket patterns are developed by in-house designers. Some are based on historic designs created to serve the Native American market. Blanket stories, told on hangtags and on the website, credit the inspirations and traditions behind the patterns. We also commission Native American artists to create designs, and adapt existing artwork (usually paintings) into blankets. These artists are always compensated and credited by name for their work. You can learn more here: Native artists. Pendleton is proud to support organizations that serve Native Americans, veterans and America’s National Parks. Our relationship with The American Indian College Fund spans more than twenty years, and our endowment to the College Fund provides scholarships for Native American students. Pendleton also makes annual donations to NARA (Native American Rehabilitation Center) to support outreach and health care for Native American women. In 1909, Pendleton was one of many mills producing wool blankets for Native Americans. Now, over a hundred years later, we are the only mill still weaving wool blankets for Native Americans here in the USA. Native Americans were our first, and are still our most valued customers. Thanks to everyone who has written in support of our shared history and friendship. We hope we have answered your questions, but if you have more concerns, please write to us at PendletonWM@penmills.com and we will respond. We are listening. Learn about a vintage pattern’s evolution from 1960s skirt to fashion forward coat, with stops in our design studio, woolen mill and photo studio. 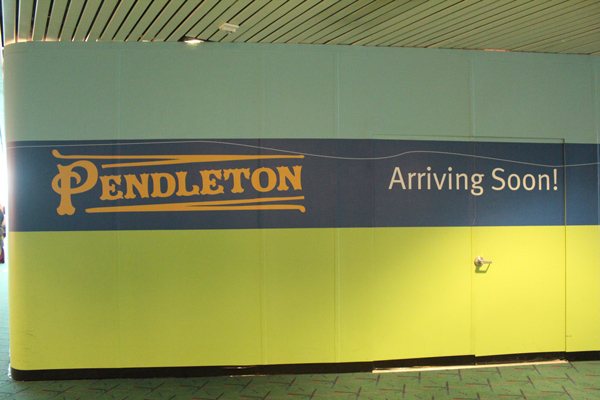 Our new store at the PDX airport opens soon! We’re pleased to announce the opening of our first store at the Portland International Airport. This location will showcase Pendleton’s heritage for travelers from all over the country and the world. Doors will open on Saturday, August 4th, with a grand opening celebration planned for Thursday, Aug. 9th at 10 a.m. This dynamic translates into an exclusive merchandising mix, with Menswear and Womenswear in an extensive assortment of iconic Pendleton plaids and patterns. A rich collection of blankets will include plaid and tartan throws and National Park blankets, and the Native American-inspired jacquard Trade blankets for which Pendleton is so well-known. Beginning in September, shoppers will find The Portland Collection for Fall 2012. This collection offers a fresh perspective on Pendleton’s iconic textiles as seen through the eyes of three independent and talented Portland designers. To mark the grand opening, Pendleton will host a ribbon cutting and an American Indian blessing along with store specials throughout the weekend. For now, we invite you to enjoy a slideshow tour of the store in progress. You will see a lot of Shelley Prael in these images. The slideshow starts with her scrubbing away a century of wear on the gears that eventually grace the store’s walls. Shelley also designed and created the dressing room wallpaper, a collage of vintage ads from Pendleton’s past. As Pendleton’s visual director, she has been hands-on through the creation of this exciting, unique space. We want to extend our heartfelt thanks to Shelley for her vision and hard work in bringing our new store to its opening day!